What could you accomplish in a year if you had a coach to keep you in action? When you have too many projects on the go or the projects you are working on feel too big, it is easy to feel overwhelmed and not know where to start. The keys to moving forward are prioritizing and focusing on the very next step. This accountability coaching package supports you as you do just that. 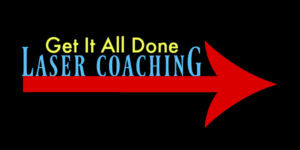 Get it ALL Done Laser Coaching consists of quick calls as often as you need them. Just enough to focus your attention and clarify the next step. No more analysis paralysis. Just action. We start with a 30-minute call to get me up to speed on what your goals are and how you work best. You get a link that you can use for the next year to schedule 15-minute coaching sessions with me. decide on a specific action that will be your homework. You have one full year to get on the phone with me for as many sessions as it takes to “Get It All Done!” and reach your goals. The only rule is that you must complete your homework before scheduling your next session. But don’t worry, you’ve got unlimited email support to help you get your homework done, and if you change your goal or need a new strategy, you can email me and we’ll set up another call and come up with different homework. I promise you, this is world class coaching to help you get real results. How would it feel to know someone’s got your back for the next year? Is 15 minutes really enough for a coaching session? Yes, if we skip the chit-chat and get right down to business, it is. Your first call may go 30-minutes so I can get to know you better, but after that, 15-minutes is plenty. In fact, the short session is a powerful way to narrow your attention to what really is THE best action for you to take next. The more overwhelmed you feel, the more pronounced the effect. Is the homework super hard? Not at all. In fact, you and I must agree on the homework. It’s usually some baby steps to move you forward, but if you’re feeling particularly productive, you can ask for more. Yes, you can have a call, do your homework, and schedule your next call all on the same day. Truly unlimited coaching. The year starts on the date of our first 30-minute call. No. I’ve never had one for this program and there likely never will be one. It’s just not worth the administrative overhead costs to either of us. Is there a guarantee? I’m not sure. The guarantee is that if you do the work, this will move you forward on your goals. If you are concerned about whether it will be worth your money, set up a free sample and see what we can accomplish together in that time. Do you do a free sample?